In the 1950’s the biggest concern scientists had for climate change was that the world was cooling down. But in the last 50 years scientists have changed their minds and now the world is experiencing global warming. But why the confusion? It has been known that the climate in the world is related to how much energy the earth receives from the sun. But over decades, centuries and millennia, the amount of energy reaching the earth changes. Whether it be solar spots, or small but subtle changes to the earth’s orbit or wobbles as the earth spins (Milankovitch cycles). It was these that initially concerned scientists that we were due for a big freeze with the growth of glaciers and the polar caps. In actual fact the world is according the Intergovernmental Panel on Climate Change (IPCC) is getting warmer and in the latest statement in 2007, this United Nations body stated that "Most of the observed increase in global-averaged tempertures since the mid 20th century is very likely due to the observed increase in anthropogenic Green House Gas Concentrations." In other words manmade CO2 is very likely the cause of the increase in temperature. With changes in climate now inevitable by at least 1-3.5°C in the next 100 years the question is what will the implications be for the wine industry? The industry will certainly change - wine is the canary in the mine for the agricultural industry, that is wine will feel the influence of climate change well before other agricutural industries. The two biggest influences on a style of wine from a region is climate and grape variety. Grapes are often thought of as secondary but the types of grapes suitable for a region are largely dictated by the local climate. So a change in climate will mean that the wines in a region will change in style and possibly new varieties will be cultivated. This is not true for all grapes, some grapes are more sensitive than other. 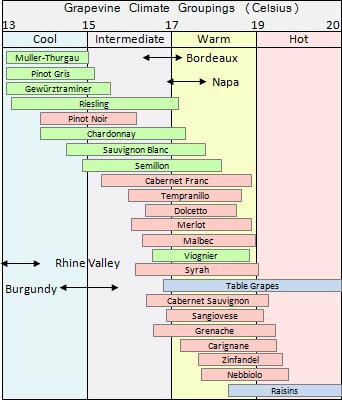 For example Pinot Noir is very sensitive to climate while its Burgundian stable mate Chardonnay is easy to grown in a wide range of temperatures (the table below shows the temperature ranges of many common grapes). The different effects on style for Chardonnay from the climate are quite noticeable, for example a cool climate Chardonnay such as Chablis is often lean and high in acidity - a very different wine to a hot climate fruit cocktail Chardonnay from Australia. 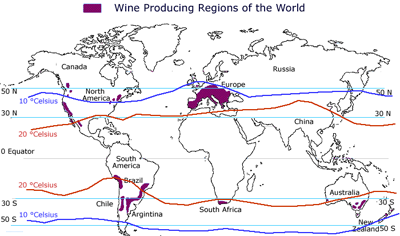 The second picture at the bottom of the page shows the current wine regions of the world with upper and lower grape growing temperture ranges. A key change in climate that will affect wine production is an increase in temperature, particularly in the Northern Hemisphere. This is primarily because the temperature of land heats up much faster than the sea. Also higher tempertures often mean more humidity and likelihood of heavier rainfalls. The total level of rain may not change but when it does rain it will rain heavier for shorter periods of time. The result will mean less water absorbed into the ground and, surprisingly, a decrease in water available in the vineyard. This will be particularly acute in sloping vineyards where the rain runs down the slope and further reduces the available water. What will happen to the wines I like? In the short term very little, remember you are looking at very small changes in the probability of say a drought or a wet summer. For example many people believe the good run of recent vintages in Bordeaux is due to positive effects of climate change. Certainly regions in higher latitudes will over time see a gradual improvement in their wines caused by more reliable vintages. Other regions at low altitude near 30 degrees latitude will find the temperature slowly increases making it more difficult to grow the grape varieties they currently use. The key trend in the next 5 to 15 years will be in the structure of wine. Warmer temperatures mean lower acidity and higher sugars in the grapes. Sugar converts to alcohol so the end effect is lower acidity in the wine and higher alcohol levels. Acidity gives a wine bite and an edge and often can make a wine feel lighter in the mouth. Alcohol gives fatness to wines and richness, so as the temperature rises wines will feel fuller and heavier in the mouth. While some people prefer full and heavy wines many of the classic styles rely on acidity - this includes New Zealand Sauvignon Blanc, Bordeaux reds and white Burgundies. To preserve the current styles of wines, the easiest thing a producer can do is pick their grapes earlier. As grapes ripen the acidity drops and sugar levels rise. Many Northern European regions are now picking up to a month earlier than 100 years ago. There is a limit to how early grapes can be picked. If picked too early the grapes will not have enough time to develop flavours and ripen tannins. As a result, eventually regions will need to be replanted. One simple way to minimise the effects of climate is to replant the vineyard not in rows North to South as is currently common, but at an angle. By increasing the angle grapes are planted at, the heating effect on the grapes decreases, slowing ripening. But vineyards could simple choose to replant with other grape varities that are better suited to the change in climate. The table above shows the typical temperature ranges for grapes. Over time you could find that the wines shift about. Will Cabernet Sauvignon be the backbone of Bordeaux in 100 years time or will it give way to Carignanne, Petit Verdot or other varieties? Changing grapes varieties is one effect climate change will have on wine regions, another is the development of new regions. Already English wines are going from strength to strength as the 'improving' climate makes winemaking more viable. This represents one change as vineyards drift to higher latitudes northward for Northern Hemisphere and southward for Southern Hemisphere. There will also be those who will start growing grapes at higher altitude. The higher a vineyard is, the lower the temperature. New vineyards will open up further and further up hills as producers attempt to get access to cooler zones. A rise in temperture will also see a rise in humidity, as the moisture carrying capacity of the air increases. This will see some varieties suffer at the hands of mildew and moulds. Not all vines are as susceptible as others. For example, the thin skinned Pinot Noir needs a dry climate to minimise the effects of moulds, while Spain's Albarino variety can cope well with high humidity and accompanying moulds and mildew. One way to manage the temperature change is through canopy management and vineyard layout. More foliage may shelter the vine and their is a number of methods of creating cooler canaopies. A simple change in the orientation of the vines from the normal North South axis will reduce the energy from the sun reaching the vine. This will reduce the vine's exposure to the sun's energy in a similar way that the energy from the sun is less in the morning and evening when the sun is lower in the sky. What will happen to different wine regions under climate change? This a very difficult question to answer and I will only attempt to deal with the how as opposed to the when. Let's start with the big picture then drill into examples of different countries. Climate change has, as its engine, gases in the atmosphere that increases the insulation around the earth. The same energy is reaching us from the sun, it’s just that less radiates back into space. The greenhouse gases insulate the earth. But the heating is not likely to occur evenly over the planet. The ocean and its currents circulate warm water from the equator to the colder poles of the planet. By acting as a huge cooling system, areas near large oceans will not heat up as much as areas in large land masses. If you look at the globe the Northern Hemisphere has much more land than the Southern Hemisphere which will stay relatively cooler. As temperatures climb the ability of the air to hold moisture increases, so expect higher humidity for coastal regions. Higher humidity also means more rain, think Indian monsoons for some of today’s hotter regions, but where the water forms and drops is based on geography as well as climate, remembering in general, winds bring the weather from the west. Obviously local geography matters but if you have a range of mountains on the west coast it will be wetter than the east coast. Rain often falls when pushed higher by mountains, such as the southern alps in New Zealand or the Andes between Chile and Argentina. Some regions will become drier as increased temperatures evaporate the low rainfall they receive. These regions will tend to be inland and continental in nature. Let's now look at the geological and possible climatic effects. We said earlier that wine regions in the Southern Hemisphere surrounded by water will have a smaller change in temperature, than wine regions in continental countries. Maritime regions all over the world will have in general an increase in humidity, but particularly Northern Hemisphere coastal regions. New Zealand is an example where humidity and associated fungus and disease pressure on the grapes will increase, but perhaps not to the same extent as, say, Bordeaux which is coastal with a huge land mass nearby. Water supply in smaller countries surrounded by water will be more secure, meaning New Zealand's water supply will be secure. Similarly Chile and Argentina with the very high Andes between them will continue to have access to water picked into clouds in the Southern Pacific Ocean and dumped on the Andes. The three regions Chile, Argentina and New Zealand should cope well with climate change and have plenty of room to move South to cooler wine regions if the temperature rises too far. Australia and South Africa, the other two big Southern Hemisphere producers will not fair so well. Australia’s wine producing engine room follows the mighty Murray River as it flows from the Australian Alps and Snowy Mountain range on the eastern part of the New South Wales and Victoria border, through Riverland and Riverina wine producing regions, and finally to the sea near Adelaide. Already the temperature is very high, and many feel that Australia with its large land mass and continental climate will be too hot for grapes, irrespective of how reliable the Murray River is in the future. There is a risk that wine regions in inner Australia will just become too hot. The cooler coastal regions should survive but a huge drop in wine production is likely to occur. South Africa has a similar problem but with no land to travel further south to cooler regions, South African producers are going to have to be very careful with how they deal with climate change, if they are to survive. What can wineries do to mitigate climate change? Wineries can reduce their carbon output in a number of ways. Some have gone the route of becoming certified as Carbon Neutral. Wineries such as Wairau River Wines in Marlborough New Zealand have become accredited with carboNZero certification, New Zealand’s programme for organisations that reduce and offset their emissions. New Zealand has led the world in carbon-neutrality for wineries, with Grove Mill, another Marlborough-based company, becoming the first-ever. This was followed by South Australia’s Elderton Wines and then Backsberg Estate in South Africa. Since then a few more have popped up in the New World. Fertiliser is often added to the soil of many modern vineyards. This is sometimes to replace missing nutrients such as nitrogen, iron or to bolster organic material. Frost protection in cool regions can be carbon expensive as well as very costly. Whether it is burning pots of oils in the vineyard or hovering a helicopter over the site, protecting vines requires energy. One of the lowest energy methods is to have windmills that can be used to move often warmer air above the vines, (known as an inversion layer) onto the vines. Pumping in the winery uses power, but are not used as often as pumping water for irrigation. To counter this, gravity feed water systems are best. Tractors, like all vehicles, use diesel. Minimising tractor and vehicle use can reduce the vineyard's carbon footprint. Fermentation by its nature produces carbon and creating wine involves fermenting grape juice. The process of fermentation causes sugars to split into alcohol and Carbon Dioxide. In recent times some wineries have considered capturing the carbon dioxide rather than vent this into the air. Refrigeration is required in both the production of wine and the storage of wine and can be expensive to run in both CO2 and money terms. Good building design, insulation and placement can reduce this. But some form of active cooling will always be required since fermentation produces heat. Packaging is a significant source of carbon. Typically half the weight and volume is wasted in a case of 12 bottles. Wineries can reduce their effects on weight and wastage by reducing the amount of glass. Recent initiatives by WRAP has resulted in less glass being used in wine bottles. However other options are becoming available, including wine in plastic PET bottles, Bag in Box and Tetra packs. All reduce the amount of packaging used vs glass. Shipping wines can be very carbon intense, but most wines are not flown to their destination instead they are shipped by sea in containers. Some methods of shipping are better than others. A typical wine box containing 12 bottles is 30cm x 30cm x 27cm = 0.0243 cubic metres or 24.3 litres of space but with only 12 bottles it ships 12 x .75litres = 9 litres of wine, under half the spaces capacity if filled completely with wine. This method of shipping in bulk, while very efficient, is limited to large branded producers who have the volume to invest in such operations and have their wine bottled overseas. Many smaller producers prefer to have control over the bottling process to ensure quality standards and are too small to ship bulk wine. Wine is a non-essential luxury good that produces 0.1% of manmade greenhouse gases. So what should a winery do to manage this? There are a number of important things a winery can do to manage climate change both to mitigate the effects, but also to reduce their own carbon footprint. In recent times you have seen many wineries becoming carbon zero and following The New Zealand Wine Company, who make Grove Mill, Sanctuary and Frog Haven. But this piecemeal approach has created a problem, the crux of which is that each country is developing its own certification body, with each body able to set a different standard. With a range of different standard the question is, what do you include in deciding your CO2 footprint, where do you stop? Frost protection, fertilisers, harvesting the grape production and bottling many people would agree on. But what happens after the wine is made, shipping the wine to the market and moving it to the shop to be sold. What about the person buying the wine, going to the shop, chilling the wine down and recycling the glass? These could all be taken into account. Then on the flip side, how do you account for the carbon produced in making the tractor used on the winery in the first place. What is needed is an international body setting the rules! The problem is who, and how do they get agreements quickly. After all what is green to one person is not green to another. No, the calculations to value a carbon foot print are going down a similar path to Organics. That is where each country or Bloc (as in the EU) decides on what is required to become a standard and if two countries agree to a common minimum standard then the wines can be labelled as such in the country where the wine is purchased. This type of system has many advantages, for example, if a standard is constructed but later needs to be changed perhaps due to more information becoming available, it is easier to get two countries to agree a change in a bilateral contract than an international agreement. It would also be quicker to agree. There have been a number of standards created. In New Zealand CarboNZero was what The New Zealand Wine Company used. But since then carbon zero status has been applied to wines in Bordeaux and South Africa, with each country having their own standards. The next step is to create international bilateral agreements that will support and develop brands that the consumer will become aware of. Work is already underway between the New Zealand Australian and Californian governments to come up with the first international bilateral definition of carbon free. The impact of global warming highlighted in the recent Intergovernmental Panel on Climate Change (IPCC) report signals how grape growing across the world is likely to change in the future. Grape-growing is going to change in the future because of global warming. More wineries are setting their sights on becoming carbon neutral in order to avoid contributing to climate change. Whether it’s the result of climate change or just the vagaries of nature, the weather has heralded an early harvest in parts of Europe. The laborious Mosel-Saar-Ruwer is going to become simply ‘Mosel’ from the 2007 vintage. The change comes after years of lobbying by the region’s growers’ organisation. Pomerol producers are opposing new legislation forcing them to make their wines within the appellation's 780 acres by 2018. The popular rosé styles currently called White Zinfandel and White Grenache are having to change their names. Majestic's half-year trading figures show its change in strategy to reduce minimum purchases to 6 bottles seems to be paying off. Like-for-like sales increased by 5.4% and pre-tax profits were up 9% to £6.1 million over the period.